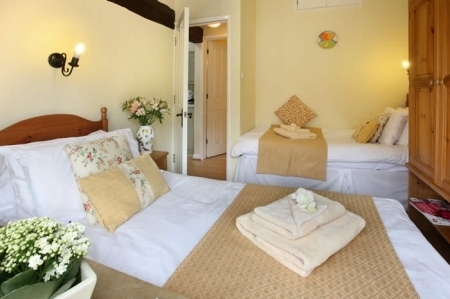 A luxury cottage sleeping four with 2 bedrooms - one double (plus cot) and one twin bedroom. It has an open plan living area with an open plan lounge/kitchen/dining area. Bathroom with bath/shower above, WC and handbasin. Perfect for a family get together. One double bedroom (plus cot) and one twin bedroom. Crisp white 100% cotton linen/duvets made up ready for your arrival. Bathroom with bath/shower above, WC and handbasin. Welcome Cream Tea on your arrival.